It’s Not a Handout, It’s a Hand up! On August 28, Habitat for Humanity of Martin County Board Member, Nina Ferraro was on hand with son Joey, 7, to celebrate the grand opening of the Carter Park Development in Indiantown and to dedicate the first four homes to the Sanchez, Mondragon, Jackson and Juan families. 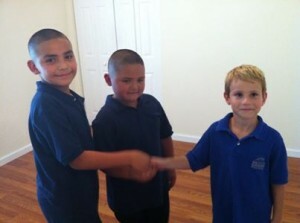 “My favorite part was meeting the kids and checking out their new rooms,” said Joey. Each family contributed 300 sweat equity hours working on their homes and the homes of others as a requirement for becoming Habitat homeowners. Through the donations of funds, materials and volunteer labor, Habitat was able to build these four homes and sell them at an affordable price. The families each purchased their homes with a no-profit loan and their monthly mortgage payments will be used to build additional Habitat houses. Since 1992, Habitat has built 31 homes throughout Indiantown and plans to build a total of 40 affordable, energy efficient homes with two-, three- and four-bedroom floor plans in the new Carter Park community. With the support of the community, corporate sponsorships and funding, Habitat estimates the build-out time for all 40 homes in the Carter Park community to be between five and seven years. The Boys & Girls Clubs of Martin County joined in the celebration and presented the children of each family with a lifetime membership in the Boys & Girls Clubs. To learn how you can help with the Carter Park Development, contact Nina Ferraro at nina@ferrarolawgroup.com or Mike Readling, Habitat’s director of resource development, at 772-223-9940. Visit HabitatMartin.org for more information.